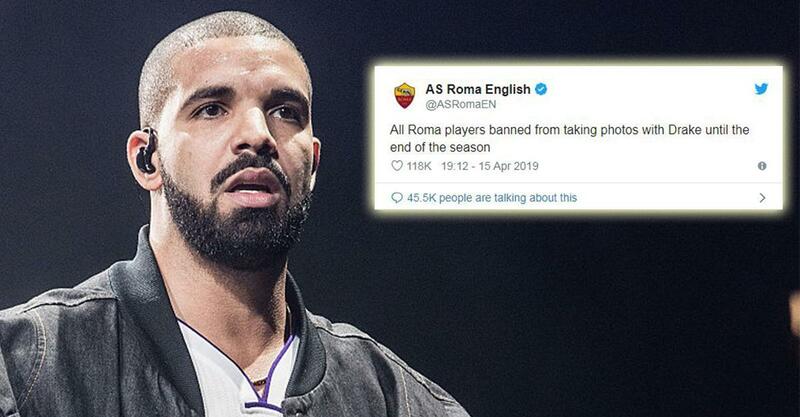 Roma have hilariously banned their players from posing with pop star Drake… because he is a “curse” to football teams. He struck again on Sunday when PSG suffered their heaviest defeat in 19 years with a shock 5-1 loss to Lille. Earlier in the week he had posed for a picture with defender Layvin Kurzawa. Arsenal and Manchester City recently succumbed to the curse when their stars were pictured alongside the artist. The Gunners had their top four hopes dashed when they crashed to a 1-0 defeat at Everton after Pierre-Emerick Aubameyang shared a snap with the singer. And City’s Sergio Aguero saw his penalty saved by Hugo Lloris in the 1-0 Champions League loss to Tottenham not long after taking a selfie following his Manchester concert. So with Champions League qualification on the line, it is no surprise Roma are taking drastic measures. Other examples include Borussia Dortmund’s Jadon Sancho having a picture with him before their 5-0 defeat at Bayern Munich and Paul Pogba before Man United’s FA Cup loss against Wolves. Drake also has history with Juventus. After posing for a picture in their pink away strip in 2016, the Old Lady went onto lose the Champions League final against Real Madrid. Fans following Roma’s Twitter were quick to praise the social media handle for their humour.